Recently, my husband and I flew across the country to the Napa Valley for a vacation. I don’t usually bring a laptop with me, even though most hotels have wi-fi in the rooms. Going through airport security is just not worth the hassle. As a result, I end up spending many hours going through email, updating podcasts on iTunes, and checking web sites when I get home. This time, however, I had an iPhone. Would that be enough to keep me up-to-date and lessen my computer catch-up time when I got home? I have two email addresses, one with Gmail and one with my ISP. I forwarded my ISP mail to Gmail, but kept a copy on the server. This means when I got home all the mail I had already downloaded onto my iPhone would re-download onto the computer. You can choose to not keep a copy on the server; I felt more comfortable knowing my email was still available to me on my computer. So, everyday I had full access to all my email at both addresses. I was able to respond to friends and family, delete what I didn’t need, and keep those emails that needed my attention when I got home. Even though all email downloaded onto my computer I was able to delete read emails very quickly and just re-read and respond to emails I knew I had saved on the iPhone. What a time saver! I’m a big Facebook user and Twitter follower. Using the free Facebook and Echofon iPhone apps kept me in the loop with the happenings of friends and family. Plus Facebook allowed me to share pictures of my vacation instantaneously, instead of having to wait until I got home. Of course I used the iPhone to take those shared Facebook pictures—click the picture, upload to Facebook. Simple. The baseball playoffs started during our vacation. My beloved Boston Red Sox and my husband’s team, the New York Yankees (yes, we are happily married, thank you very much!) were both playing. We weren’t always near a television to watch these games. What to do? The fabulous At Bat 2009 came to the rescue. 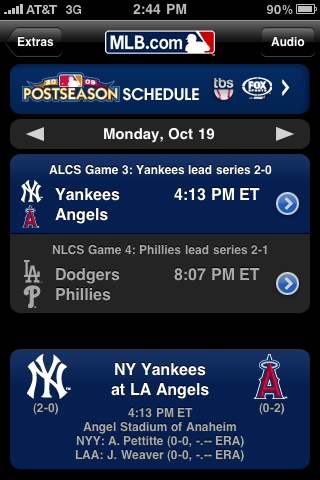 A bargain at $9.99, At Bat 2009 gives you the scores of all games in progress, allows you to follow any game you choose with live audio, and toward the end of the season started streaming one or two live games everyday. You can also check standings, watch videos of highlighted plays in a game, and learn a little bit about your favorite team. No matter where we were, if a game was on, we were able to follow it. I also used this app a lot at home. You can be sure I’ll be purchasing At Bat 2010 when it’s released in the Spring. For the plane ride I read my Kindle. So much easier than dragging around big, heavy books. When I had some time to kill between winery visits, I opened the free Amazon Kindle app on my iPhone. 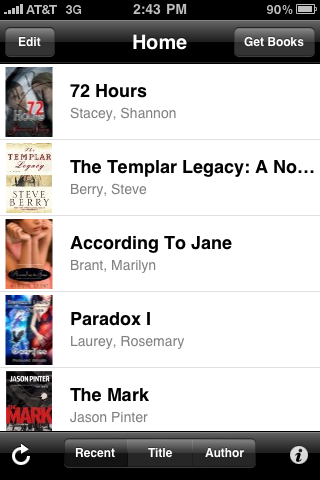 This app syncs up with my Kindle, so I can pick up reading where I left off. Very convenient. I’m an avid knitter, so I have to scope out yarn shops when I’m away from home. I went to a fantastic store in San Francisco called ImagiKnit. There was so much beautiful yarn to choose from, but there was one problem—I didn’t have the details to any potential future projects with me. Not a problem, really; I launched Safari and went to Ravelry.com. Ravelry is a web site for fiber enthusiasts that includes, among other fabulous features, free patterns, complete with yarn requirements. I was able to log on to my account, look in my queue, choose a pattern and purchase the appropriate amount of yarn. No guess work, no worries that I didn’t buy enough or the correct weight of yarn. iPhone to the rescue again. I subscribe to what seems like a million podcasts. I don’t like to get too far behind on my listening, so went to the iTunes Store on my iPhone and downloaded a few of my podcasts that had released new episodes since I left for vacation. Granted, I wasn’t completely caught up by the time I got home, but every little bit helps. Traveling can be very stressful. Printing out flight times, confirmation numbers, hotel addresses—it uses a lot of paper and can easily get lost or misplaced. I used the Notes app that comes with the iPhone to keep track of addresses and driving directions. Notes was also handy for keeping an eye on expenses, and jotting down details of the wines we tasted. For confirmations I forwarded the emails to my Gmail account where I could easily access them whenever I needed them with the Mail app. Purchasing an iPhone is one of the best decisions I’ve ever made. While it probably won’t be enough to replace a laptop in a business situation, for a personal trip, the iPhone will pretty much do everything you would need it to do in lieu of a laptop. Just download the apps you need, and enjoy your vacation!